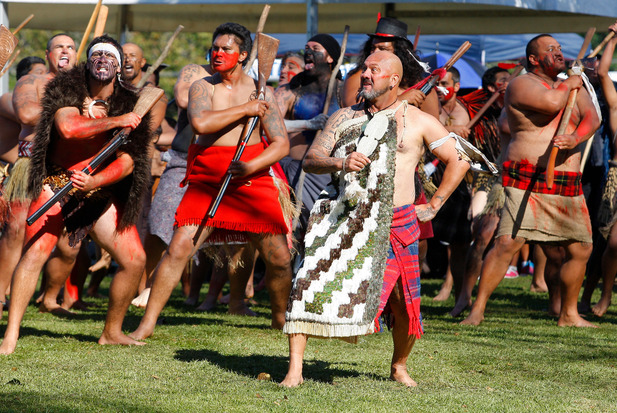 The Maori People of Tauranga staged a 150-year commemoration of a victory in the last major battle against the British in a losing effort from the New Zealand Wars, that resulted in significant confiscation of their lands and autonomy. Gate Pa hill in Northern New Zealand was transported to a time 150 years ago when Maori warriors and British soldiers clashed in what was to become a historic event to form the creation of Tauranga city. Photo from Radio New Zealand. Gate Pa – or Pukehinahina in 1864 – was the scene of one of the most significant land wars between Maori and British forces who were determined to crush the Kingitanga movement. The Maori people are the indigenous people of Aotearoa (New Zealand) and first arrived there in waka hourua (voyaging canoes) from their ancestral homeland of Hawaiki (the mythical homeland in tropical Polynesia), almost 1,000 years ago. The arrival of Europeans to New Zealand starting from the 17th century brought enormous change to the Maori way of life. Today, Maori make up over 14 percent of the population. Their language and culture has a major impact on all facets of New Zealand life. For a more comprehensive video on the commemoration, click here. Rising tensions over disputed land purchases and attempts by Maori in the northern region of Waikato to establish what some saw as a rival to the British system of royalty led to the New Zealand wars in the 1860s, conflicts known by the Maori as the Pakeha’s (European) Anger. These conflicts started when rebel Maori attacked isolated settlers in Taranaki but were fought mainly between British Crown troops – from both Britain and new regiments raised in Australia, aided by settlers and some allied Maori (known as kupapa) – and numerous Maori groups opposed to the disputed land sales including some Waikato Maori. At the peak of hostilities in the 1860s, 18,000 British troops, supported by artillery, cavalry and local militia, battled about 4,000 Maori warriors in what became a gross imbalance of manpower and weaponry. Although outnumbered, the Maori were able to withstand their enemy with techniques that included anti-artillery bunkers and the use of carefully placed pa, or fortified villages, that allowed them to block their enemy advance and often inflict heavy losses, yet quickly abandon their positions without significant loss. One of the most often recounted stories of the Land Wars of the 1860’s is the Battle of Gate Pa (Pukehinahina), a fight between the Crown and two Tauranga Moana iwi: Ngai Te Rangi and Ngai Potiki,. It has captured people’s imagination for two reasons – first because of the defeat of an elite force of professional British solders by Maori irregulars, and second, because of the honorable conduct of Maori towards the dead and wounded soldiers. In commemorating the Battle of Gate Pa, the Maori honor their tipuna (warriors) and British forbears who fought and died at the battle. This significant historical event was the founding of Tauranga city. As a result of these battles (including where the British overcame the Maori at Te Ranga), land was confiscated and the British settled in Tauranga.